Well, I do believe we have done all the preparation for another odyssey / adventure that can be done. This will be another there and back again, but without dragons, rings, elves, dwarves, and wizards, though that would definitely add interest. Elaine and I have done all the little repairs to the homestead and performed the small maintenance tasks that every house seems to need. In addition we have (I hope) made all the needed modifications to our new rig and Elaine has spent days arranging cupboards and closets to best utilize our 334 sqft home on wheels. I am writing this and will continue as it seems there are a number of people who find it enjoyable following along on our adventures and have asked that I continue. I enjoy doing the blog and it makes for a dandy scrap book. This summer we will be traveling through eastern Utah to see Arches and Canyon Lands and then heading west through Salt Lake City, UT and Reno, NV to California wine country, then north to Medford, OR to see friends and finally to the southern Oregon coast where will be volunteers in two state parks. It promises to be a great trip and I will keep you posted. There are to more creature comfort items I have added to Bertha since I wrote the modification post. 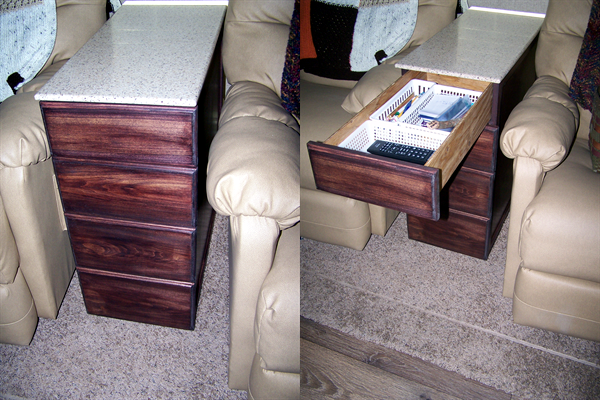 I created this 4 drawer end table to hold all the items we like to have nearby when we are in our easy chairs. It is stained to match the cabinetry and has a matching solid surface top. 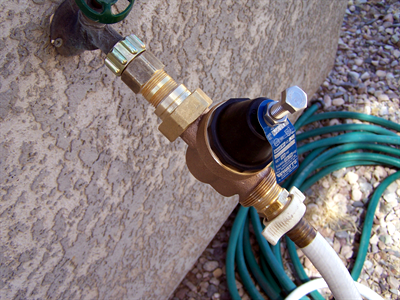 I often have not used a regulator on the water line like I should because of the reduced flow they caused so I purchased this “Big Boy” 3/4″ pipe model at the local home improvement center and added the hose adapters. Now no more worries about the plumbing and plenty of water. That’s it for changes and additions. Hope it all works!! I have had a little time to pursue my hobbies during this short visit at home. I made this yarn bowl for Elaine for Mother’s Day. 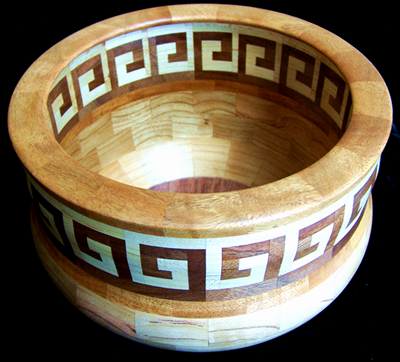 It has a total of 271 pieces and is made from narra, walnut, maple, cherry, and mesquite. Elaine has taken up crochet as yet another hobby / creative outlet. Well Gordon just had to try his hand at making some hooks for her. 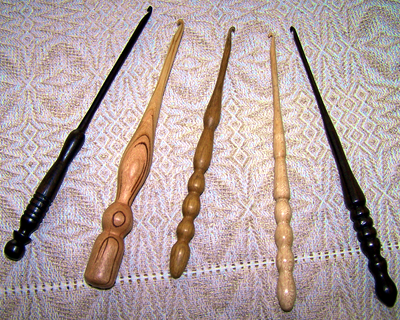 From left to right they are ironwood, cherry, saguaro, maple and ebony. I will most probably be making more as they were an interesting challenge and they use up some of the “too good to throw away” wood scraps. We will hit the road on the June 2nd so I will soon have some travel news.